Valentina Aquila, an assistant professor of environmental science, is an atmospheric scientist who uses global climate models, as well as satellite, aircraft, and ground based observation to understand the role aerosols play in the world's climate system. She focuses on aerosols resulting from volcanic eruptions, geoengineering, and pollution. Here she talks about her career and her latest research. Large volcanic eruptions like Bali's Mount Agung in 1963, or Mount Pinatubo in 1991, inject large amounts of sulfate aerosol particles into the stratosphere, which is normally nearly completely clean of particulates. There, these aerosol particles reflect solar radiation back to space, effectively cooling the Earth's surface. But sulfate aerosol in the stratosphere also enhances the destruction of ozone, interfering with the recovery of the ozone hole. I study these volcanic eruptions and how exactly they affect the Earth's climate. To do this, I use a global climate model, along with satellite observations. After obtaining an MS in physics at the University of Genoa, Italy, I moved to Munich, Germany, to pursue a PhD in meteorology at the Ludwig-Maximilian University. There, I carried out a PhD thesis at the German Aerospace Center (Deutsches Zentrum fuer Luft, un Raumfahrt, DLR), where I started exploring the capabilities of climate modeling and figured out a way to model the transformation of soot and dust aerosol into cloud forming particles by changes in their properties. I moved to the United States to start a postdoc at the NASA Goddard Space Flight Center, and then worked as a research scientist at Johns Hopkins University. During these years, my research moved from the troposphere to the stratosphere, where I applied my expertise in climate modeling to stratospheric aerosol from volcanic eruptions. Through targeted model simulations, I study the interplay between chemistry, radiation, and dynamics in the atmosphere. Volcanic eruptions are not the only source of aerosol in the stratosphere. Man-made tropospheric pollution is brought to the stratosphere within convective systems, such as the North American and the Asian Monsoon, and intense forest fires can project carbonaceous particles across the tropopause in spectacular events called pyrocumulonimbus, or pyroCb. 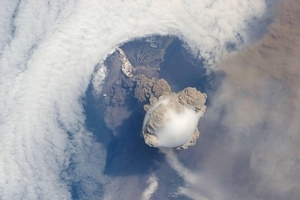 Lastly, recent observations have shown that even small volcanic eruptions, which were previously thought to be confined to the troposphere, can reach the stratosphere when taking place in favorable locations or time of the year. Since observations have shown a sizeable increase in stratospheric aerosol by up to 7 percent per year, I am performing model experiments to track the contribution of each of these sources to such increases, to determine the man-made and natural contributions to climate change. My lab also works on geoengineering. Given the observed cooling of the surface temperatures after a volcanic eruption, scientists are now working on the possibility of injecting sulfate aerosol into the stratosphere with the goal of counteracting global warming, a method called solar radiation management. This idea is still in its infancy, and there has been no deployment yet that could give actual data. Scientists still need to understand how effectively this technique would work the goal of counteracting global warming, and what the side effects would be. This is a task that can only be achieved through climate simulations, because a deployment would be too dangerous until the complete climate impact has been assessed. I started my new appointment at AU in August 2017, and I look forward to engaging with AU students. Students in my lab will be given opportunities to develop skills in computer programming and statistical analysis of large datasets. I have ongoing collaborations with NASA Goddard in Greenbelt, MD, and I would like to see my students take advantage of these connections to gain valuable experience outside AU. Feel free to contact me via email or to drop by my office if you would like more information about my lab and my work. I hope to meet you soon!